A slip and fall can happen unexpectedly at any moment and in any location. The injuries that often result can range from a mild bruise to a serious head or neck injury or broken bones. If your fall was caused by something that the owner of the property knew about or should have known about and didn't fix, you may be entitled to compensation for your injuries. 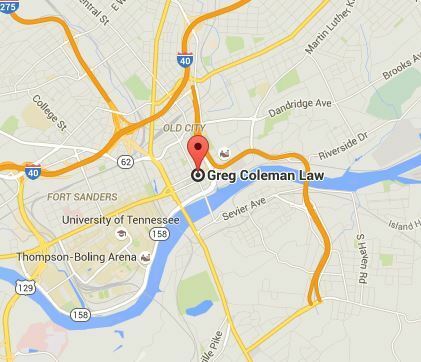 The legal team at Greg Coleman Law will fight for justice in your case, and will help you get the compensation you deserve. Our team of slip and fall lawyers boasts a successful track record of helping our Knoxville clients gain maximum compensation for their injuries. Schedule a free case evaluation today to review your claim. Contact us today by calling (865) 247-0080 or by filling out our online form . Most slip and fall injuries are caused by hazardous conditions that pose a risk for injury. These can be permanent or temporary. Permanent hazardous conditions include uneven walkways, cracked pavement, broken handrails, and even lack of proper lighting. Temporary hazardous conditions include wet floors and other conditions caused by inclement weather such as snow and ice on walkways. When it comes to determining liability in a slip and fall accident, it depends on the type of hazard that caused the injury. If the accident was caused by a permanent hazardous conditions, liability typically lies with the property owner, as these conditions should have been known and remedied. In the case of temporary hazardous conditions, liability will be determined based on whether or not the property owner had enough time to learn about the conditions and remedy them. A slip and fall accident can occur in any location, including in the workplace, at a business, or on private property. In the case of a fall at a business, a customer is considered an invited guest, as they are at the location for the commercial benefit of the business. Property owners and businesses are expected to take reasonable care to prevent foreseeable issues and exercise normal precautions, including warning of potential dangers. A court will also determine whether or not the injured party contributed to the slip and fall accident. They will need to know how your actions played a role in the incident, including what you were doing just before the accident and if you ignored any warning signs. Any award of damages may be lowered based on the percentage of responsibility you held in the accident. Our Knoxville slip and fall lawyers will examine all of the details of your claim and determine if a lawsuit is right for you. In the case of a slip and fall injury that was not your fault, you may be entitled to compensation for your injuries. You may be able to recover funds for medical expenses, lost wages, pain and suffering, as well as injury-related expenses that you may incur in the future. If you have suffered from an injury due to a fall, it is in your best interest to seek help from a qualified slip and fall lawyer. Slip and fall injuries can be quite serious, leading to seemingly endless expenses and a lengthy recovery period. Our personal injury lawyers specialize in this area of the law and can help you pursue a claim for compensation. Your initial case evaluation is free of charge, and we will review the details of your case in order to determine if legal action is right for you. We work on a contingency basis, and only get paid when you do. Schedule your free consultation today by completing a Free Case Evaluation form.